I was asked by a friend about to jet off to Paris to make a version of crepe cake to share with you. Parisian you wanted? I stared aimlessly at photos of complex looking creatures called crepe cakes on the internet for what seemed like an eternity. I recollect it being akin to staring directly into the sun. I knew I shouldn't but I just couldn't take my eyes off of them. Place sugar, water, rum and mint leaves in a small saucepan, turn the heat to medium and bring to a boil. Turn the heat off, cover and let sit for 20 minutes. Once cool pour syrup through a strainer and set aside. If you make nothing else, make yourself a batch of this for your ice tea - trust me on this one. Use a French crepe pan, but a 9" or 10" skillet will work too. Heat the pan on medium heat, when hot add a little sliver of butter, pour in about 1/2 cup or a small ladle full of crepe batter and swirl around until the batter is near the edge of the pan. Let cook undisturbed for about 45-60 seconds, until the top starts to look dry. Jerk the pan a little, if the crepe slides off easily it's ready to flip. Flip and cook a few seconds on the other side. Place the crepes on a plate to cool for a minute before stacking them on a baking sheet separated by sheets of wax paper. Place the mascarpone and lime zest in a bowl, mix together and set aside. Add the whipping cream and sugar to a bowl and beat until the whipping cream is stiff. Fold 1/3 of the whipped cream at a time into the mascarpone mixture. Set aside. Spray a 9" spring form pan with no-stick spray. Place a crepe in the bottom of the pan. 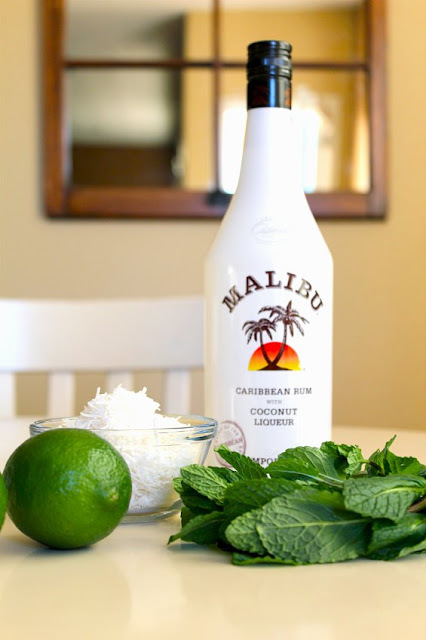 Use a pastry brush and brush the crepe with a little bit of the Malibu Mint Syrup. Place a small amount of the Lime Mascarpone Cream on top of that and use a small offset spatula to level. Make sure and push the cream all the way to the edge of the pan to fill in any gaps. Repeat until the pan is filled to the top, ending with the cream mixture. Garnish with 1 cup of coconut that is toasted in a 350 degree F oven for 3-4 minutes, fresh raspberries and melted chocolate. Don't deny the urge, you can't resist the crepe cake, it's futile! Can't wait to hear all about your grand trip Courtney. Good to see you back Gina! Congratulations on your big move, can't wait to get together;-) yum, crepe cake, very pretty my dear! Glad that you survived the garage sale:) Sounds like it was a success. This cake is drop dead gorgeous, and has all of my favorite flavors, lime, coconut, and rum! Can't go wrong! So nice to have you back:) Also glad to hear that the garage sale went well. That is so funny about the fight over the cookie jar, hehe. Your cake looks so good, never had one made from crepes. Stopping by to check it out. I'm off to get the recipe. This cake is MINE! I love shopping garage sales but I *hate* having them myself. "You have a price of $25, can I have it for 5 cents?" "Sure." I'm horrid at it. The last sale I had I hired someone to handle it for me. Gina - this crepe cake confection looks just out of the this world! Hope the move went well and you are settling in! You need security at your next sale I think. You have been missed, Gina! The cake looks splendid! I'm just visiting over from one of my favorite blogs, C & C Cakery! What a day you had; happy for you that is went well...lots of shopper. That crepe cake is WOW! Get some rest Gina. My trip got so much better when I saw this recipe pop up. For serious. Everyone needs a little bit more crepe (and BOOZE) in their lives. Thank you so much, my friend! I'm ready to take a trip just to get one of those cakes! It looks amazing. I wish my garage sale had been even close to that when we moved. Great selling! I was at Courtney's blog on different post (hop over to another guest post), then I saw your comment so I came here...and now you are guest posting at Courtney's blog. I'm going back and forth today! This is totally WOW! I've heard about crepe cake but never actually had it before. Looks like a lot to stuck on, but I bet this is so worth it. Looks absolutely gorgeous too! I'm checking on your post on Courtney's blog again. haha! GINA! This is fantastic lady! Really just fantastic. I love how the layers are so close together. Perfect cake for the upcoming spring season! Ooooooh, crepe cakes = awesomeness, but with coconut?? I am in love! This is my kind of cake!!! Looks delicious!